This is one of the largest job search networks for college students and recent graduates. Today, much of this hiring is done offline, and the focus of this business is to convert the existing offline activities and build on the potential of online campus hiring. The site is exclusively targeted at entry-level hiring. It maintains the largest database of colleges and students across various courses in India and facilitates handshakes between relevant employers and prospective students. With an in-depth understanding of the entry-level job market and a proven and successful track record in the recruitment industry (being a naukri.com group company), the site is well-equipped to market the graduate effectively to potential employers. For fresh graduates, it offers help in building the perfect CV, tips on personal grooming, and advice on how to present oneself to the perspective employer. For the recruiters, the site is the perfect platform to reach a huge database of talented, entry-level employees plus showcase their companies to the graduate community through a wide range of recruitment solutions such as online videos, presentations, etc. It makes the entry-level hiring process easier and quicker for organizations by ensuring that they reach deserving candidates even in remote corners of the country. 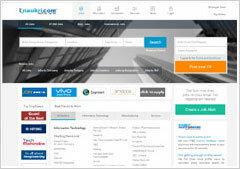 Naukrigulf.com is Info Edgeâ€™s foray into the Gulf market. Quadrangle has an established client base, which extends to over 150 companies across India and abroad with whom it works very closely. With a qualified team of recruitment professionals in every industry and every functional discipline, Quadrangle provides clients with high-quality talent for their organizations. It has built and sustains a reputation of excellence in all its verticals - executive search, management search, IT search, international search and KPO/BPO vertical. With a team of multidisciplinary consultants spreading across India and with specialty practice teams, it provides clients with seamless service in recruitment. 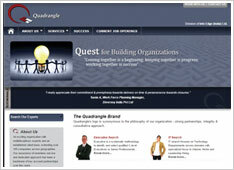 Quadrangleâ€™s distinctive edge also comes from its association with India's largest and oldest job portal, naukri.com.